Home Abs Protestors Head To Times Square Against Donald Trump’s Transgender Military Service Ban! The people are fighting back! As we reported, on Wednesday, Donald Trump released a statement on Twitter where he announced transgender individuals will no longer be allowed to serve in the military. Related: Twitter Reacts To Donald Trump’s Transgender Military Ban! 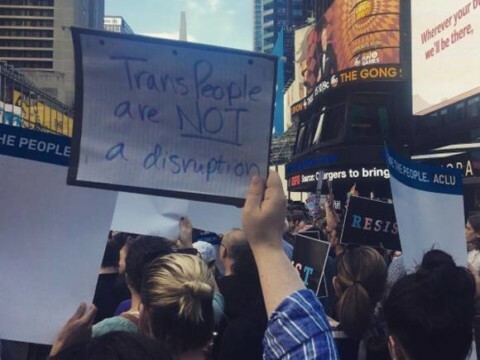 Several organizations — including Equality New York, GLAAD, and the New York Civil Liberties Union — made their presence known at the demonstration. Marches were also held in San Francisco and Portland. Ch-ch-check out the pics from the protest (below)! Previous articleQuincy Jones Wins Big In Michael Jackson Music Royalties Lawsuit! Next articleThe Chairless Chair Is Real & People Are SO Ready For It! Patton Oswalt & Fiancée Meredith Salenger CLAP BACK At Fat Shaming Trolls!